When we watch the news, our hearts break for a world in need. But Christians are not powerless to help: we can pray. In fact, that's exactly what God tells us to do: "petitions, prayers, intercession and thanksgiving [should] be made for all people" (1 Timothy 2 v 1-2). If we're serious about reaching our local community and the wider world with the gospel, the first thing we'll do is pray. Trouble is, most of us don't know where to start. How do we pray meaningfully for people who we don't know and will probably never meet? Deep down, the issues seem too big, too emotionally disconnected, and we're not sure our prayers will really make a difference. That's where this little book is designed to help. It will equip you to pray powerful prayers for the world around you—prayers that really change things, because they're based on God's word. Each spread takes a passage of Scripture and suggests 5 things to pray for a local, national, or international issue. Because when we pray in line with God's priorities as found in his word, our prayers are powerful and effective (James 5 v 16)—and that's a truly thrilling prospect. Use this book in any number of ways: work through it as part of your daily quiet time, or pick it up whenever a situation arises that is in particular need of prayer. From Jesus' disciples to Martin Luther's barber and beyond, "teach us to pray" has been a frequently heard heart-cry. But the truth is we can only really learn to pray by praying. Here 5 Things to Pray for your World will help you. It takes an old idea, tested and tried throughout the ages – a prayer list – and turns it into a thought-provoking, vision-expanding, prayer-stimulating tool. It is small enough to fit into your pocket, but big enough to change your life. Simple, but brilliant. We all know we should pray for the world. But where to start? 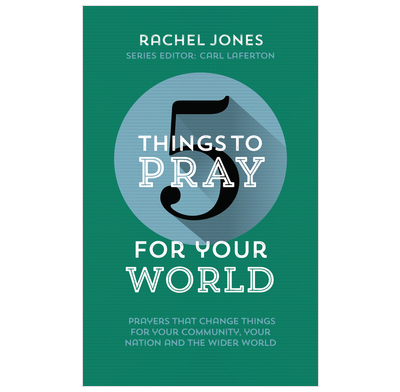 5 Things to Pray for Your World is a great option. It will expand the horizons of your prayers as well as shaping them by God's word. I loved Rachel's first two books and this third does not disappoint. Praying Scripture is liberating and exhilarating. Rachel's new book helps us to do that carefully, wisely and in a biblically focused way, without being constraining. The prayers I pray as a result are still very much my own. I will be using this superb resource both in my own devotions and in church life. I've never encountered such a positive response from a book centred on prayer. We recently ran our week of prayer and I chose this series to be the theme. I have had several people enquire about receiving copies and sharing how they see prayer in a wider and practical context. I used this particular book for our focus on Remembrance Sunday 2017 praying for our armed forces. It was received very well. Praying for the needs of our world has overwhelmed me in recent years. This book helps to focus thoughts and prayers for our world, based upon scripture, and has the end result of getting me praying - what's not to love?! Accessible and helpful for all ages, I have used this with my parents, youth group and at a Church prayer meeting. An excellent resource to help us pray for a world in need. If, like me, you cry when you read the news, you'll find this book extremely practical in helping you to respond in prayer to the things that happen both close to home and further afield. We've really no excuse not to be praying when there are resources like this to help us. Anyone could use this book, so if you're not used to praying it would be a great place to start. For those who are more seasoned pray-ers, it is full of Biblical ideas. We have also used these books to help us plan prayers for our church small group.